It seems like there has been a lot of controversy about what cask ale is in the US so I wanted to jump in with my worthless opinion. I enjoy real cask ale because it is a very specific style of beer that has as much to do with how the beer is treated after it leaves the brewery as it does the brewing of said beer. (for a good primer see this written by Mark Dorber, formerly of the White Horse in Parsons Green and a pioneer in good cellaring practices – http://www.anchoratwalberswick.com/page/cellarmanship). 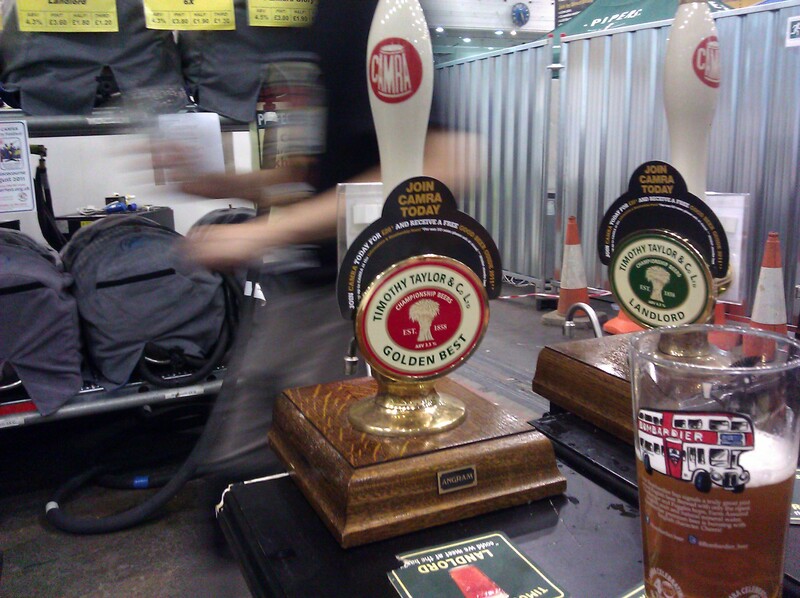 A good real cask beer is something few outside of the UK know or understand. Real “cask” beer is transferred into a firkin, pin or another “cask” before reaching final gravity, i.e. it is still fermenting, finings are then added to clarify the beer and often a small additional dose of hops are added (again their use is restrained as the focus is on the balanced beer). Real cask beer is cellared when it arrives at the pub and the use of soft spiles are employed until the fob of foam rising to the top takes several seconds to accumulate at which time the hard spile is introduced carbonation develops and tapping can then take place. Contrary to practices in most of the US casks are not moved or if they are they are given at least a day or two to settle once again before tapping. I can’t count the times I tried beer from a firkin just manhandled from a cold room to get a glass full of slop. I differ from some recent purists in several ways because I believe based on historical evidence that a real cask beer can be of a high original gravity. Many historical British ales were brewed stronger than they are today as English beers as we know them now were dumbed down in many instances during austerity measures in the mid 20th century. (if you have a fast PC and lots of bandwidth and want extreme historical accuracy see http://barclayperkins.blogspot.com/) I also differ some from the opinions of CAMRA which looks down on the use of “breathers” which keep oxygen out of tapped casks, as I understand how short shelf life can be without their use. However I also disagree with those (like Mark Dorber) that say using breathers doesn’t impact flavor because using ambient air does introduce oxygen and in the early stages of tapping I do think oxygen adds something subtle to the dispensed beer. Great cask beer should be brilliantly clear, slightly effervescent and never flat with a good foamy head. Flavor development in real cask beer lends itself to subtle styles like bitters and pale ales, although I have had great casks of porter and stouts at the GBBF. Beers with huge flavor profiles are not nearly as good in many instances because the heavy flavor additions dominate and overshadow what makes cask special. I object to the use of the term cask when referring to what many in the US produce and label as “cask”. I have no objection whatsoever in adding all kinds of things to a stainless serving vessel and using it as a long term randall of sorts, which is what most “cask” in the US is, I just wish they could think of another term such as “kegging experiment” to describe it. If brewers wish to add fruit, vegetables or umbilical chords to their 10% imperial stouts then so be it, and sure I might taste it to see how it turned out. (for a counter opinion see http://www.dingsbeerblog.com). However, having seen the promised land my paradigm is skewed as I know what real cask beer tastes like and how much work and effort backed by hundreds of years of tradition is involved when making true “cask”. I also object to a common practice I have seen with some brewers calling anything that looks like a cask a “firkin” (which is a size designation) when they are using smaller “pins” – I guess this is just another instance showcasing the proliferation of incorrect terminology. Anyway, in conclusion when I see “casks” popping up all over town I quietly repeat to myself “cask, cask everywhere but not a drop to drink”. Now give me a glass of that hazy imperial stout aged with cherries, oak chips, and elderflower. Cloistered with a bubbly personality. This entry was posted in Beery Happenings Beyond, Blogroll, Central Texas Beer Happenings, Houston Beer Happenings, Uncategorized. Bookmark the permalink.